Divorce mediation or co-mediation are sensible approaches for couples planning to separate or divorce. Mediation may be used for many family law needs, including issues relating to child support, time-sharing/custody, equitable distribution and post-divorce issues, such as co-parenting and learning to get along in a blended family. In the mediation process, couples meet with a trained mediator, who facilitates the voluntary agreements that the couple makes together. During the process, the couples will address, discuss and resolve all the issues that will be written into their agreement. Because the mediated setting is relaxed though structured, it allows couples to negotiate with each other in an atmosphere of dignity and respect. For these reasons and many others, mediation has been proven to be more cost effective, less stressful, and faster than a litigated divorce. Divorce can be accomplished without financial devastation. Click here to find out more about how we deliver our services, what to expect during the mediation process, and what you can do to prepare for your divorce. Mediation is not about winners and losers. It’s about helping couples reach agreements that are not only in their own best interests but in the best interests of their children as well. Mediation supports couples who are no longer married to remain good parents to their children. Divorce does not have to be war. When angry, destructive battles leave the family devastated emotionally and financially, mediation supports the family structure and avoids protracted and expensive conflict. Where a litigated divorce often tears the family apart, mediation helps to preserve the family and avoids making the children the victims in a separation or divorce. Mediation is the family way. Mediation can help to re-sculpt lives, restructure the family and create a new possibility for the future. It’s a way for two adults to divide what needs to be divided without acrimony, keeping in mind that they would rather divide what they have with each other rather than with their lawyers. 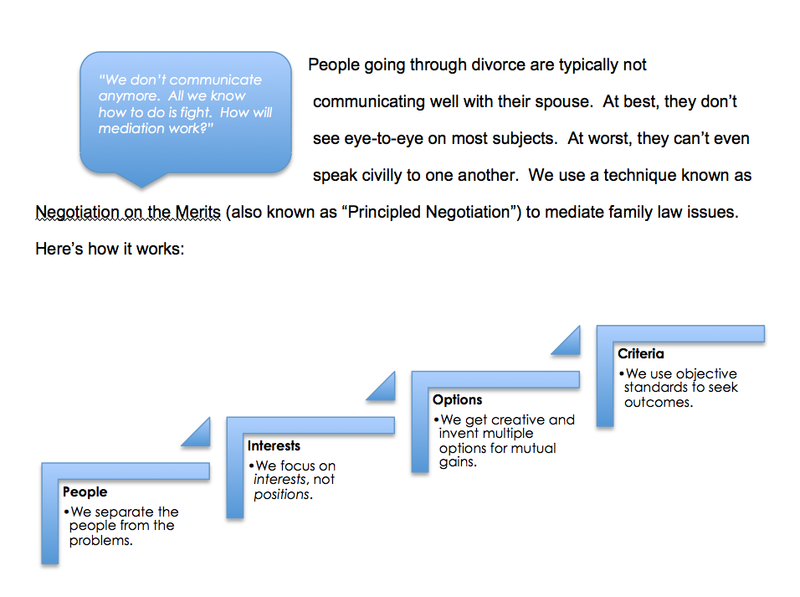 Mediation is the pro-family approach to divorce. Mediation is for parents who understand that the children’s needs and interests must come first. In mediation, couples recognize and clarify how co-parenting their children once they are no longer living as husband and wife is crucial to their children’s health and well being. Preparation is one of the keys to a successful mediation. It is not only important for the parties to be substantively prepared but also mentally prepared for the process of negotiation. If a fact or figure is in dispute, a more efficient resolution will be facilitated if all documentation which supports the claimed fact or figure is presented and available during the mediation session. Even if the information is not known to be in dispute, any written material to verify the accuracy of a party’s claim is helpful, in case an issue should arise at mediation. Being able to answer questions immediately with objective supportive documentation can allow the mediation to progress without the need to continue the session or place contingencies on any resolution that may be reached. Lawyers or unrepresented parties may provide the mediator with a Summary of their case prior to the mediation session. This is helpful for the mediator to prepare for the issues that might arise and become familiar with who is involved in the dispute. Premediation summaries are optional and can be mailed or faxed to the office at least 48 hours before the scheduled session. Cooperative learning. By communicating through two professionals, who are skilled at maintaining a respectful discussion without resorting to litigation, the parties often learn by example how to improve their own communication skills for future post-divorce interactions. Efficiency. A second professional allows you to divide and conquer the responsibilities, creating a more efficient (and less costly) mediation. Two-fers. Two mediators means double the skill sets and twice the opportunity for a party to connect and build trust with a mediator. One mediator may be an attorney, who can provide information about the legal process. One mediator may be a therapist or counselor, who can provide valuable insight into co-parenting or other therapeutic needs. Perhaps one mediator can offer his/her perspective from experience that only one gender can provide and relate to a similar-gender party. Team approach. Like family therapy, co-mediation offers a controlled environment, where both parties can feel safe to voice their opinions, concerns or questions without fear of repercussion. With the “group therapy” support of two mediators, the feeling that one mediator is taking sides is reduced. Cost mitigation. Using a more efficient, team-approach to conflict resolution results in financial savings by avoiding costly and prolonged litigation. The co-mediation paradigm offers the dual-perspective that a single mediator simply cannot provide, and creates a gender-neutral experience not otherwise available. Most importantly, when all parties feel like they’re being heard and understood, they are more likely to find creative ways to successfully resolve their disputes. Download our Preparing for Mediation information sheet Preparing for Mediation!